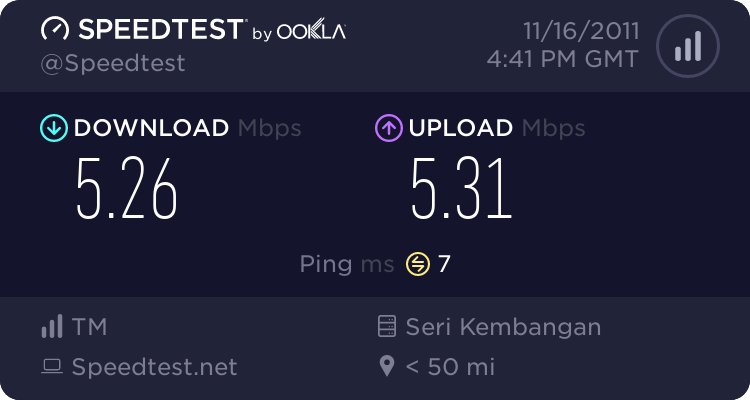 Recently, I upgraded to Unifi at home. Looking at the speed test results, I don’t really have much to complain about. I’m getting around 5Mbps rates and very fast ping times. The connections to overseas is also above the 3Mbps rate, useful for streaming videos. However, my one sticking point with Unifi is the useless DIR-615 residential gateway supplied with it. This router suffers the same problems as the standard router supplied with Streamyx as well. They both required regular reboots. I honestly think that someone in TM screwed up when customising the D-Link firmware because the issue disappeared after I upgraded the firmware on the Streamyx router from the custom TM firmware to the stock D-Link firmware. Unfortunately, this option is not available for the Unifi router because the stock D-Link firmware does not have support for the IPTV. If I upgraded it, I would lose all IPTV capabilities. Therefore, I’m stuck with using the buggy router for now. Fortunately, there are compatible routers that can be used in replacement of the Unifi router. But instead of spending more money for new routers, I think that I will just use the old Streamyx router alongside the Unifi router instead. My god, yes, rebooting all the time! And for a non-celik IT person like me, I never knew why and how to fix it! There are a number of compatible routers that you can buy in Malaysia. I have read that the TP Link TL-1043ND router comes highly recommended as an alternative Unifi router. Yea, realised that too. I’m streaming video from overseas now.